For my first CES 2014 covering Lenovo products I discussed the Lenovo Yoga 2 and other new laptops. But Lenovo also showcased new technology at CES 2014 that enables new types of mobility and flexibility with home devices – and ups the ante for professional desktop monitors (that can also be used at home). The Horizon 2 showcases one of the most exciting new developments in home technology, the PC that extends into A TABLE form factor (also called a table PC)! The Horizon 2 is slimmer (19.5mm) then original Horizon, with new features such as NFC that allows devices to share digital content directly. The Lenovo Horizon 2 Table PC has a 10 finger touchscreen, motion control features for navigation, Windows 8.1, four hours of battery, up to 4th generation Intel® Core™ i7 processor and Dolby Home Theater. When used in Stand mode, it can be used as an All in One Desktop. “Table” mode enables collaborative computing such as playing games for up to four people. Accessories include a joystick, striker and e-dice to enhance the digital gaming. Enhancing “table” mode is the Lenovo “Aura” custom interface for media aggregation and entertainment. The press release explained enables users to “upload photos from their camera or smartphone and the Aura interface will try to recognize the faces in the photos, access media from their PC or smartphone on their home network directly on Horizon 2’s display when it lays flat in Table Mode with the Aura interface activated. They can either use the new Horizon mobile app to shake their mobile Android device, allowing the content to “fall” onto Horizon 2’s screen. Or they can place the mobile device on the screen, which signals to the Aura dial to open around it and “pull” out content onto Horizon 2’s display. Also, users can edit photos and share directly from Aura to Facebook.“ In addition, the Horizon 2 also has multi-user games including Ubisoft’s Chubby Kings, Legacy Games’ Crayola’s Songbook and education apps such as I Spy from Scholastic. Lenovo announced the Beacon personal cloud storage device which allow to store and play media from anywhere using a tablet, smartphone, PC or TV. The Beacon stores files within the device. Because families these days have so much media to store, it is helpful to have a specific media storage for the home. Features include storage expandable to 6 TB and an Intel Atom dual core processor. The service has no monthly fees, can load files wirelessly or via USB connection, is able to auto upload photos from a smartphone camera via WiFi or 3G, uses Lenovo custom app on an Android smartphone to remotely control or play media stored on Beacon to an internet connected TV or by HDMI, and includes security features and ability to share with multiple users. Lenovo N308 is the company’s first Android all in one desktop that is geared for those who want access to apps, entertainment and browsing. The N308 runs the Android 4.2 Jelly Bean operating system, comes with an NVIDIA Tegra quad core processor, up to 500 GB hard drive storage, a 720p webcam and WiFi. Lenovo A740: The Lenovo A740 is an aluminum styled 27 inch All in One that is only 4mm thin. It has up to 1 TB of hard drive storage, voice and motion control, a 10 finger touchscreen display, NFC for exchanging digital content, HD Display with wide 178° viewing angle (WQHD 2560×1440), NVIDIA GeForce graphics, JBL speakers and Dolby Home Theater. Traditional notebooks Zline 14 and 15 inch for general computing are great for users on a budget. Starting at $399, they have quality features such as Intel Core processors, Dolby speakers, optical drives, different memory options 4GB, USB 3 port to work with USB 3 dock to hook into a keyboard. The 15 inch has a numeric keypad on the keyboard. The Y40 (14 inch) and Y50 (15 inch) are laptops geared for media creation and gaming with Nvidia GTX graphics, up to Core i7 and 16 GB RAM, backlit keyboard (modern design, red backlight), SSD option, touchscreen and has a 4K option. Both have JBL speakers with subwolfer. Price points starting from $699. Two other new devices are the Thinkvision Pro2840m, a 4K (28 inch) monitor that is geared toward the engineering (CAD) or professional market with full speakers for only $799!! Another is the Thinkvision 28 that is focused on consumer home market with a 4K monitor, adjustable stand that lays flat for gaming and has 32 GB storage. Touch and Android are additional features for $1199. The computer supports 4K is streaming on YouTube and Netflix. The Lenovo Flex 20 (already out on the market) is a more portable alternative to the Horizon. It is an dual mode all-in-one PC that adjusts from standing in a “desktop” mode to laying flat in “entertainment” mode but hinge is adjustable at any angle. The 19.5’HD screen (1600 x 900) has 10 point multi-touch, built in camera and microphone for video conferencing, wide viewing angle, TV tuner and the stereo speakers have Dolby Home Theater. Accessories such as joystick, striker and e-dice can be used with fun and educational games from a custom Lenovo Aura interface. The Aura was created to make the PC a “social device bringing users together to enjoy fun apps and multimedia. Games can be loaded from the Windows Store and the Lenovo app shop. The up to 2 hour battery allows the PC to be moved to different parts of the house. The USB 3.0 enables faster file transfer and copying of large media files (also backwards compatible with USB 2.0 devices). 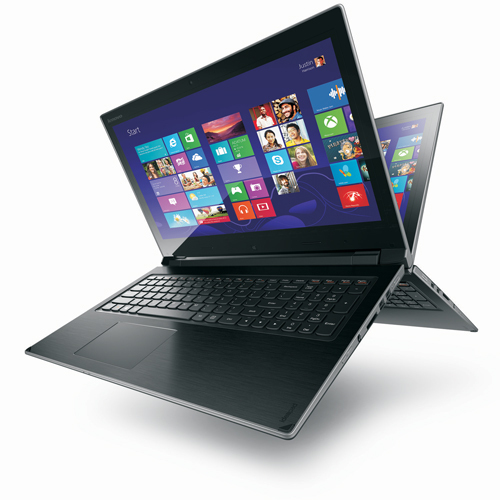 In the multi-mode category there is also the Lenovo Flex in 14D (14 inch) or 15D (15 inch) notebooks. These value convertible laptops have AMD A6 quad core processors, all day battery life, two modes (Laptop and Stand) and Dolby Advanced Audio v2 . The Lenovo Beacon personal cloud storage device will be available beginning in April with models starting at $199. The Lenovo N308 AIO Desktop will be available beginning in February with models starting at $450. The Horizon 2 Table PC will be available beginning in June with models starting at $1,499. The Lenovo A740 AIO Desktop will be available beginning June with models starting at $1,499 via major retailers and www.lenovo.com. Disclosure: This is a sponsored series for Techlicious Lenovo blogger program I received products for review as part of the program. My words are my own.